White Water Rafting is an exhilarating activity and is guaranteed to satisfy even the wildest thrill seekers in your Hen Party. Thankfully, you no longer need to head to the Highlands to experience the thrill of wild rapids as rafting is now available in city centres on man-made rivers! Your party will be tackling grade 3 rapids at a rafting centre that is just 20 minutes from the centre of Nottingham. 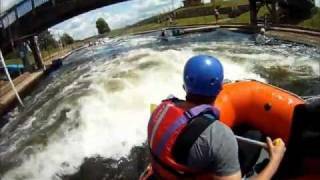 This modern rafting centre is used for many international white water events and uses the very latest technology to create frightening rapids that will test and challenge your nerves. There will be between 6 and 8 people in the raft and your instructor will shout when to paddle in order to make it down the course safely. Listen carefully to his instructions and work as a team or you might find yourself taking an early bath! View our White Water Rafting video and get an idea of what to expect on this activity.